The Sangihe shrikethrush is an elusive songbird found only on a single remote island in Indonesia’s North Sulawesi province. The species, which numbers less than 300 in the wild, was one of hundreds granted protected status by the Indonesian government earlier this year. But the government inexplicably struck it from the list soon after, leaving wildlife activists concerned that the lack of protection will harm efforts to conserve the species. Activists say one workaround would be to push for protective measures by local authorities. MANADO, Indonesia — Wildlife photographer Henri Hebimisa remembers the excitement of his first encounter with an elusive songbird inhabiting the montane forest of his hometown in the Sangihe islands of Indonesia’s North Sulawesi province. “The voice was so loud. I got very excited,” he recalls of the Sangihe shrikethrush (Coracornis sanghirensis), a species also known as the Sangihe whistler. Henri says he was lucky to see the bird, a species found only in the primary forests of Mount Sahendaruman and Mount Sahengbalira on Sangihe, an island of just 461 square kilometers — smaller than the city of Los Angeles — near the southern Philippines. He says it took more than 10 treks into the shrikethrush’s habitat before he first encountered the bird. “Camping for one night is not enough,” he says. The Sangihe shrikethrush is an elusive songbird found only in the montane forest of Sangihe Island, North Sulawesi province, Indonesia. Image by Henri Hebimisa. While little is known about the species, it’s clear that the wild population is small and declining. The International Union for Conservation of Nature (IUCN) estimates the current population at fewer than 255, and has since 2000 classified the Sangihe shrikethrush as critically endangered, or a step away from being extinct in the wild. It’s a species that doesn’t migrate. And as its habitat is lost to logging and plantations, its population has taken a hit. In light of these conditions, the Indonesian Institute of Sciences (LIPI) recommended the bird be named a protected species, which would oblige the government to prioritize it for conservation. This past June, the Sangihe shrikethrush was one of hundreds of bird species added to Indonesia’s updated list of protected wildlife. Within months, however, the Ministry of Environment and Forestry issued a decree dropping five bird species from the protected list, including the Sangihe shrikethrush. While some of the birds were removed due to protests from breeders and owners, the decision to drop the shrikethrush has raised plenty of questions. “This happened because of a lack of knowledge among policymakers,” Samsared Barahama, director of Perkumpulan Sampiri, a wildlife conservation group in North Sulawesi, tells Mongabay Indonesia. 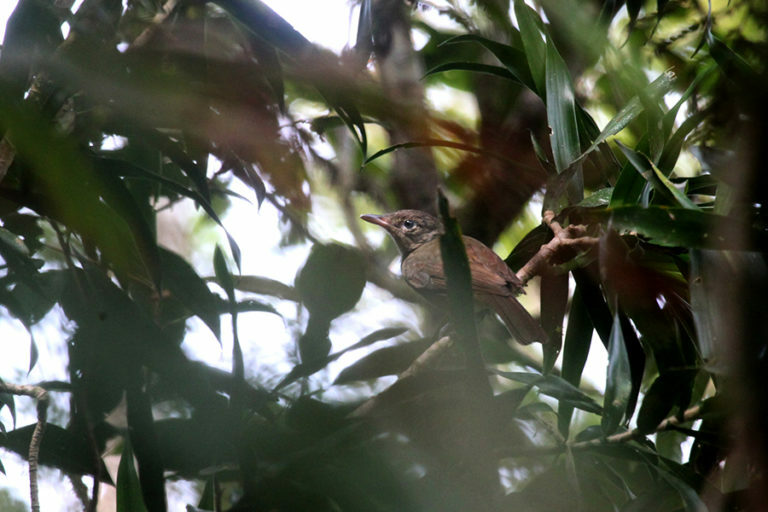 The group campaigns for the protection of Mount Sahendaruman’s biodiversity, and has since 1999 carried out community outreach to raise awareness about the shrikethrush, which was first identified by scientists in 1881. Samsared describes as “strange” the ministry’s move to rescind protection for the species. “The decision was made without any confirmation with stakeholders who are involved in bird conservation,” he says. “Just to spot it is already difficult, so imagine trying to catch it. Most people don’t know where it lives,” he says. The wild population of the Sangihe shrikethrush is estimated at no more than 255 individuals. Image by Hanom Bashari. Hanom Bashari, a biodiversity conservation specialist at BirdLife Indonesia, says a solution to this setback would be to push for protective measures from lower levels of government. “The threats to the Sahendaruman protected forest are pretty concerning because the area is home to eight bird species endemic to Sangihe, four of which are critically endangered,” he says. 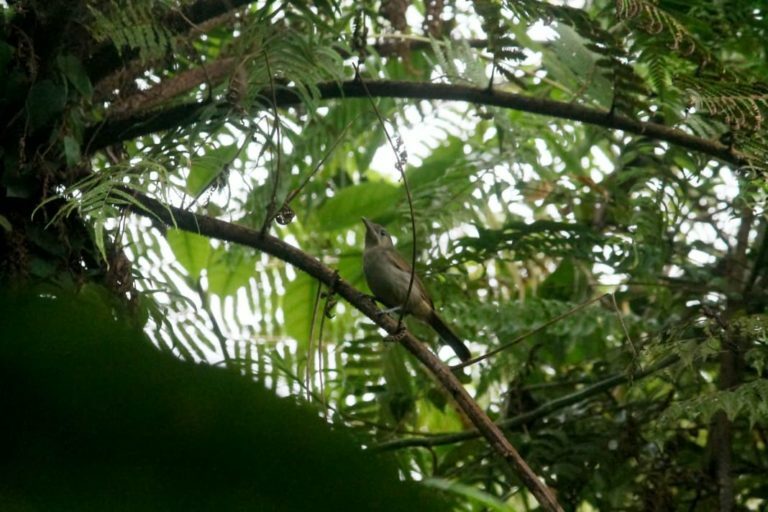 The songbird trade, deeply ingrained across Indonesia, is seen as less of a threat to the Sangihe shrikethrush than loss of habitat. The species isn’t considered desirable among most breeders and owners. Still, Hanom says endowing protected status on a species should be about more than just its propensity to be hunted or trapped. “By not granting protected status for the Sangihe shrikethrush, the species becomes more prone to be hunted,” he says. Henri, the wildlife photographer, says the removal of the shrikethrush from the protected list will hurt conservation awareness programs. “It’s disappointing. What reason should we give people then [for protecting the bird]?” he says. Oktavianus Lumasuge, a local birdwatcher guide in Sangihe who was involved in population surveys for the species, says more research is needed on the shrikethrush in particular and the wildilfe of the islands in general. “The habitats are threatened and there isn’t a clear regulation for protection. 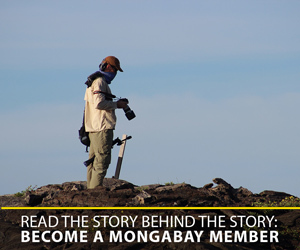 This makes it difficult to engage with the local people to be part of conservation programs,” he says. 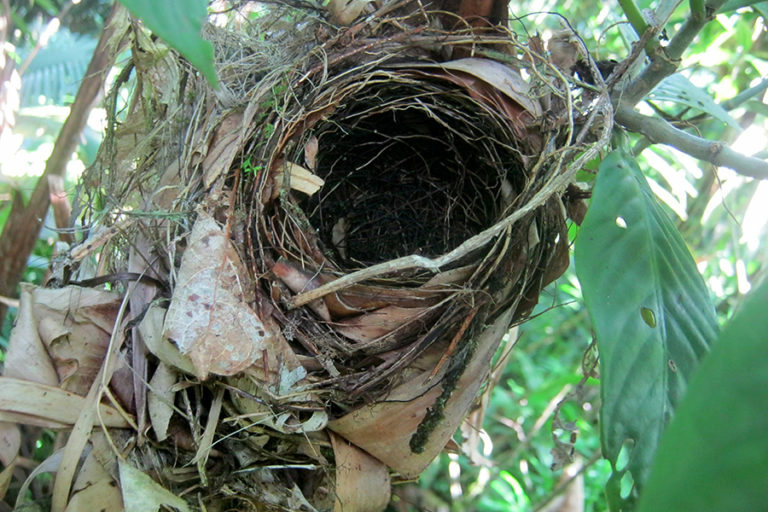 A Sangihe shrikethrush nest. Image by Hanom Bashari. The story was reported by Mongabay’s Indonesia team and was first published on our Indonesian site on Oct. 28, 2018.